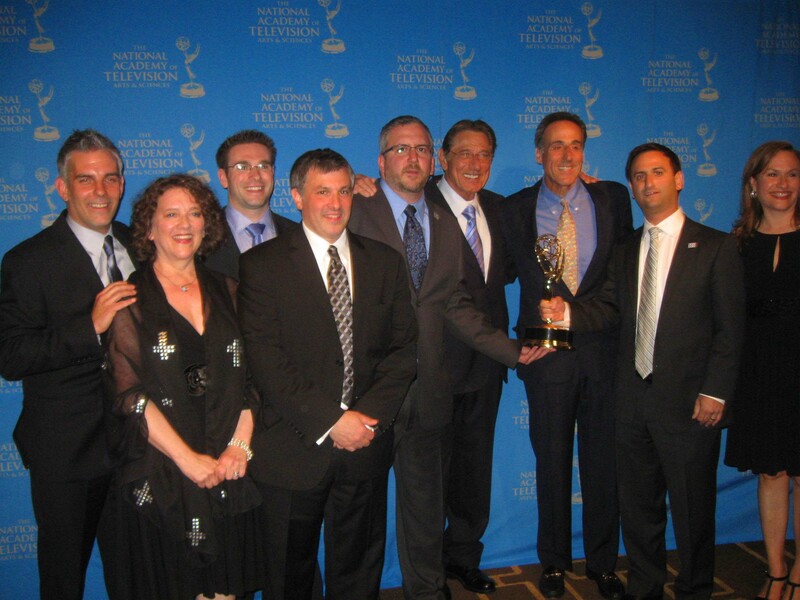 The National Academy of Television Arts & Sciences 34th annual Sports Emmy Awards were recently celebrated in NY. A major event that brings out top producers, hosts, writers and directors from television networks also included gorgeous actresses and international athletes from the world of sports. Celebrities from the sports world including the famous Russian boxer Vladimir Klitschko who along with his stunning girlfriend, “Nashville” star Hayden Panettiere were among the list of prominent sport figures and celebrities who graced the occasion. The world of sports has certainly changed over the years with athletes gaining notoriety for enormous salaries, extracurricular activities off the field and of course dating hot supermodels. Then there are those few gifted athletes who till this day, continue to maintain their legendary status and world-wide fame without being in mainstream sports. One such superstar who continues to receive the kind of respect and fame that most players work a lifetime to achieve is the famous former NY Jets quarterback, the popular and very well liked star Joe Namath, fondly known as Broadway Joe and one of the greatest athletes known to mankind. 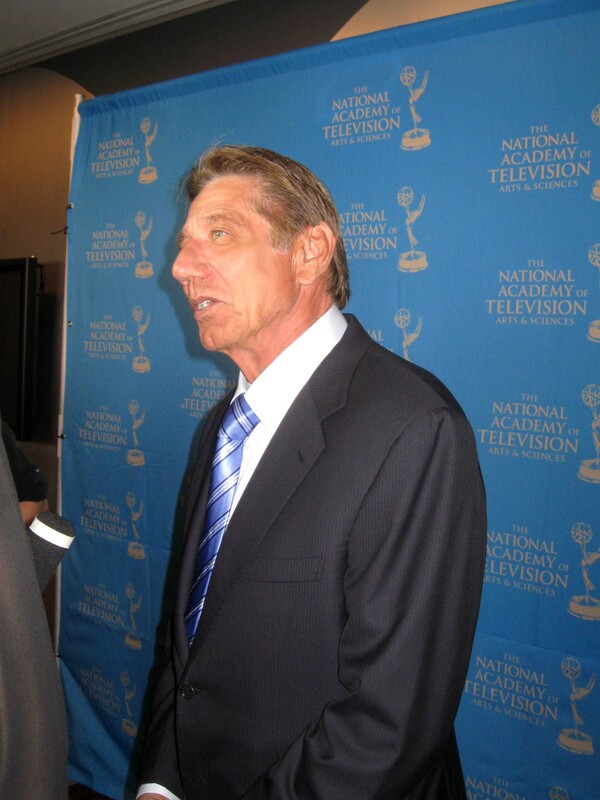 The NFL legend’s HBO documentary Namath won an Emmy for “Outstanding Sports Documentary”. The film displays Namath’s personal sports journey and features close friends, family and influential people who shaped his incredible career. Co-produced by NFL Films and HBO the documentary was executive produced by Rick Bernstein, Howard Katz and Steve Sabol. It’s a MUST SEE FOLKS!! Incredible film. I have to admit here. 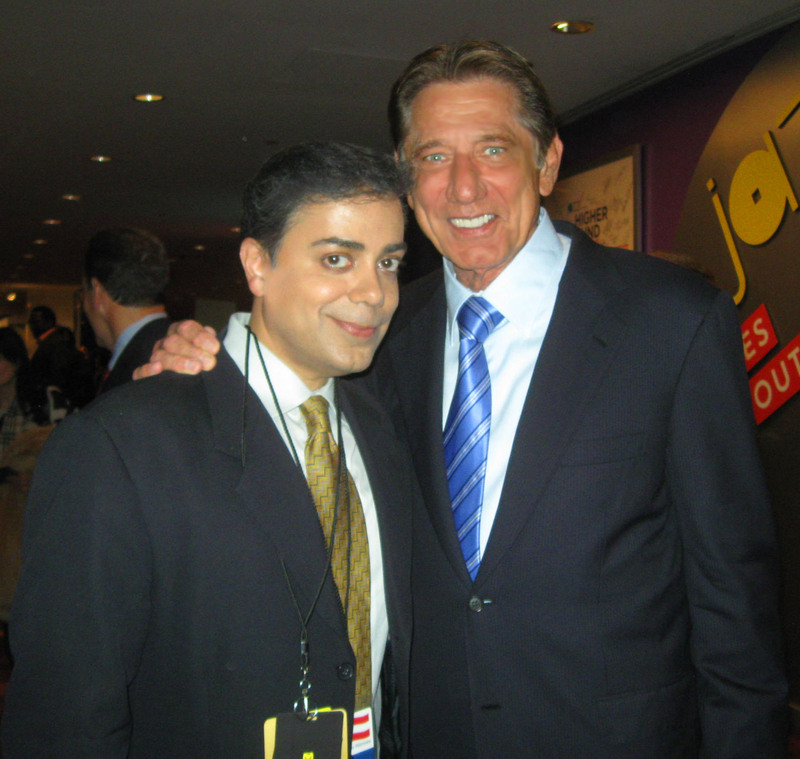 I have been a long time fan of Joe Namath. As a journalist, I follow the careers of a few very talented superstar athletes like Namath who literally rocked the word of sports during their reign. Namath was unstoppable and yet despite after all these years, the former Jets quarterback continues to maintain a massive following from Jets fans from around the world and he still has that youthful appeal that captured the attention of millions. The Ravi Report exclusively spoke to the NFL superstar backstage after his Emmy win. RR: It is indeed an honor Joe. Congrats on the Emmy win. It was such a terrific documentary filled with personal details about your life and profound career. You clearly are still well-loved and appreciated for your contribution to the world of sports. Your thoughts? Namath: You just said something there that is hard to accept all the time and I so respect that. After this documentary, I would be walking down the street and people would stop and talk to me about the documentary. When I’m in the supermarket to this day, people said they sincerely loved it. RR: The documentary was very well produced. And you know what is interesting is that those who didn’t closely follow your incredible career or had not been Jets fans, truly loved this documentary and have praised you and the HBO team for their efforts. How does that make you feel? Namath: Being a former athlete, knowing what it takes to do your part, I had a small part in that sense. The hours and time that the crew put in is mind blogging and the passion that they put into it and of course without all that, it was not going to work. I had a very small part in this. It was an incredible team that did most of the work. RR: You had a legendary sports life. To this day, new star athletes often try to become the “next Joe Namath” on the field. How does it make you feel that your legendary status still continues to this day? Namath: Well, thank you. I love life and people! I feel that karma and I like to have that feeling felt by others and want to make sure when I say hello to someone it’s a good thing and it comes from the heart. I insist on feeling good and it came along the way. I learned it. It’s selfish to a degree, but I want to connect with people and feel good about it. RR: How has the journey been for Joe Namath, the NFL Legend? Namath: Boy, I’ve been lucky and it’s ever changing. But the main thing is the spirituality and health is there. Life takes some twist and turns health wise and accidents and things and you know if we are fortunate, we need to enjoy it. I enjoy it and respect it. RR: Today’s NFL has changed so much in terms of players, salaries and talent. What are some of the major changes that you have seen over the years that have transformed well into the NFL? Namath: It’s mind blogging to see how good the athletes are today. We have come a long way and we should. You learn from your past and you are supposed to get smarter. The athletes are better because the coaches are better, the nutrition is better. I think it’s more competitive because it’s exposed to a far wider audience now then before. When I played, we had three main TV stations, now look at how much access we have to sport programming. We are winning Emmys for our work and we are getting more out of sports. RR: Congrats again Joe on the honor. You and your team so deserve it. Namath:Thank you. I feel blessed. 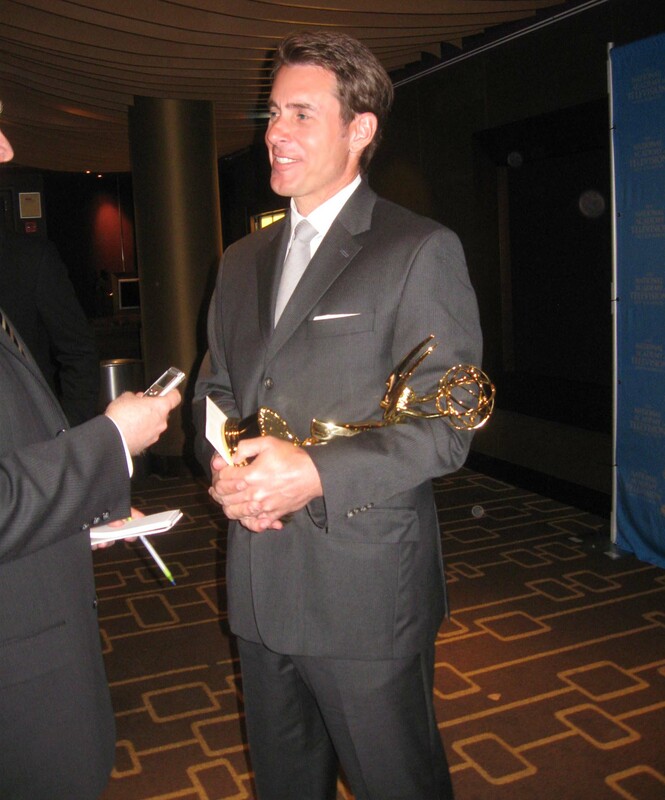 Another Emmy winner included the very talented MLB star reporter and renowned Sports Illustrated baseball writer, Tom Verducci, who won for Outstanding Sports Reporter. Verducci has been with the MLB Network for years as an on-air reporter and is considered a top and respected journalist in the sports world. A life long baseball writer, Verducci has gained an enormous amount of notoriety as both an award-winning writer and reporter among his peers and the public. “I have always loved sports.. writing about it, talking about it, being in the center of it, so it’s not a job for me because I love it so much,” Verducci exclusively told The Ravi Report after his win.